We don't have snow-capped mountains in Phoenix but, this time of year we might see some cloud-capped mountains. When I spotted these big puffy clouds creeping over the city, I drove to the top floor of the parking garage at Biltmore Fashion Park to snap a few photos. I love how this mountain shaped cloud was hovering over the Phoenix Mountain Preserve. 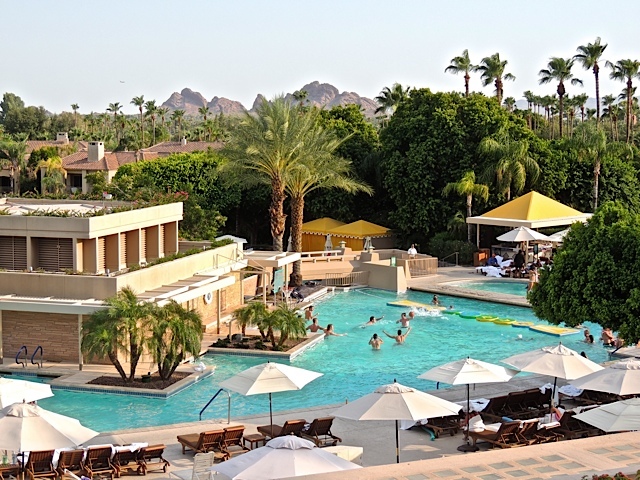 Having drinks at The Phoenician Resort gives you a view that looks out over the valley with the resort pool in the foreground. That pool is a good place to be on a hot August day. 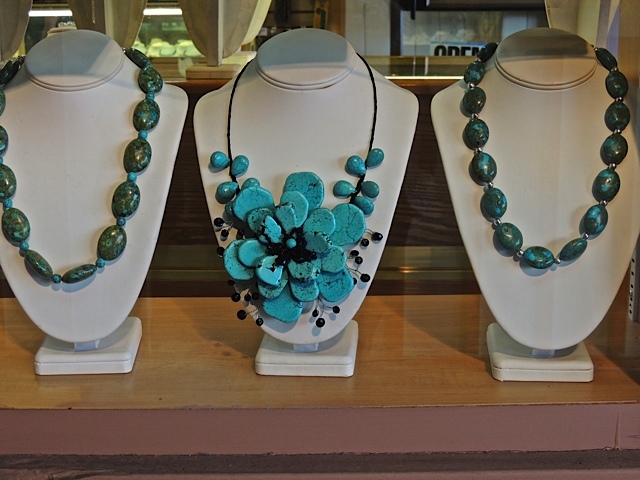 Strolling in downtown Scottsdale I walked by one of the many gift and souvenir shops and I spotted this trio of turquoise necklaces. Not exactly the normal Native American styles here. In fact, there is no resemblance to those beautiful designs in these specimens. That center one looks like it might be heavy enough to leave an indentation in the neck. No, I didn't buy any of these. I didn't even go inside. 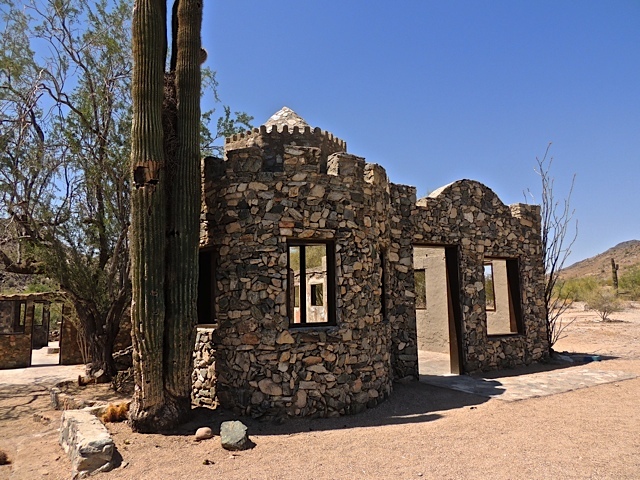 If you happen to be in the market for a desert retreat, this house in Carefree is for sale. It certainly sits in a boulder-rich location and I'll bet the views from that patio are extra nice. Sharon's Sojourns has a little blast from the past on that site today. I hope you can join other City Daily Photo bloggers on September 1st for the theme day! The September theme is "Pink". Here's an interesting business model. I found this place on the northern edge of Phoenix. The theme for September for City Daily Photo bloggers is "Pink." To participate, link your post on September 1 to the CDP theme day page. 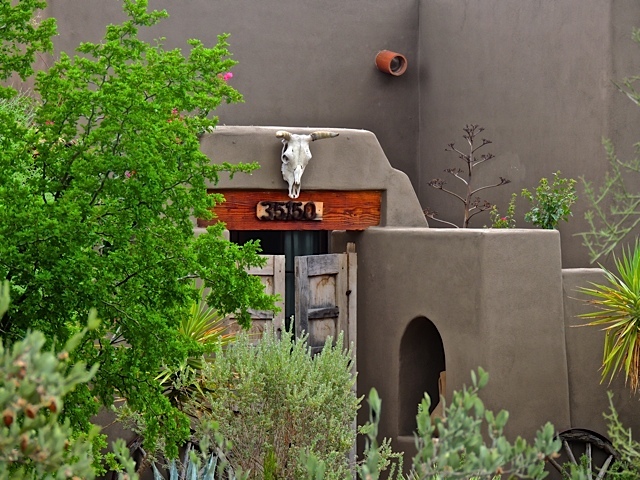 This southwestern style house was hidden behind a wall of shrubs along a road in the town of Carefree. I actually couldn't get a full view of the house but there was a break in the trees big enough for me to get a shot of this entrance. 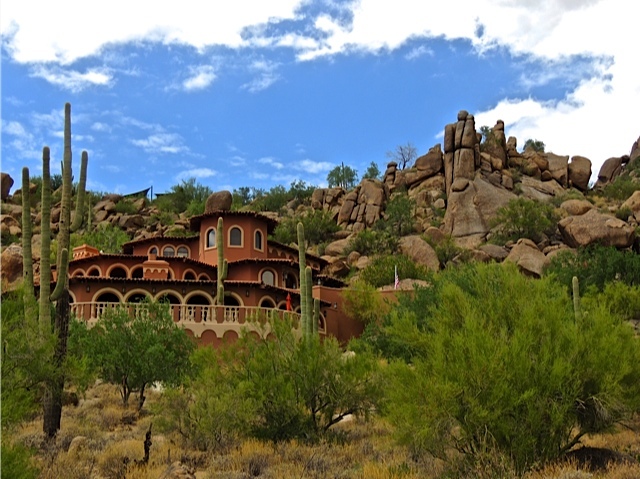 It appears to have a perfect style for a desert retreat. I took a drive out toward Carefree yesterday morning to see if I could find some interesting sky shots and when I got to the end of one road in Carefree I found this old wagon at the side of the road. I took several shots of it and suddenly remembered that I have that painting effects feature in the camera so I thought I'd give it a try. It tends to make everything too light so I made some adjustments to give it more color and I think I like the result. 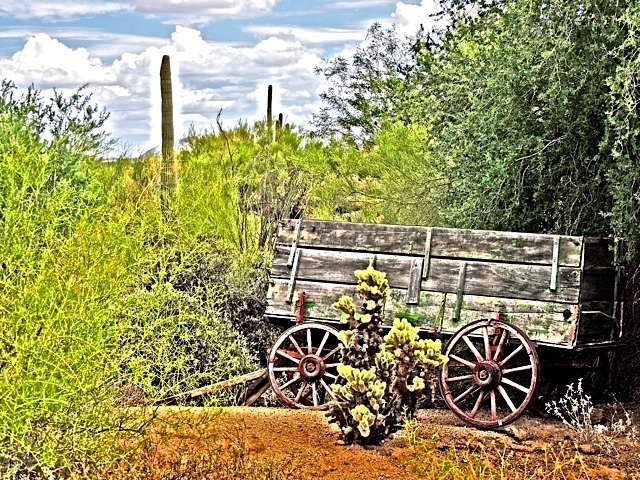 See that darker brush behind the wagon? Those shrubs sort of lined the road along here but I was able to spot little pieces of the house that was hidden behind the shrubs. Tomorrow I'll show you the shot I took through the shrubs. 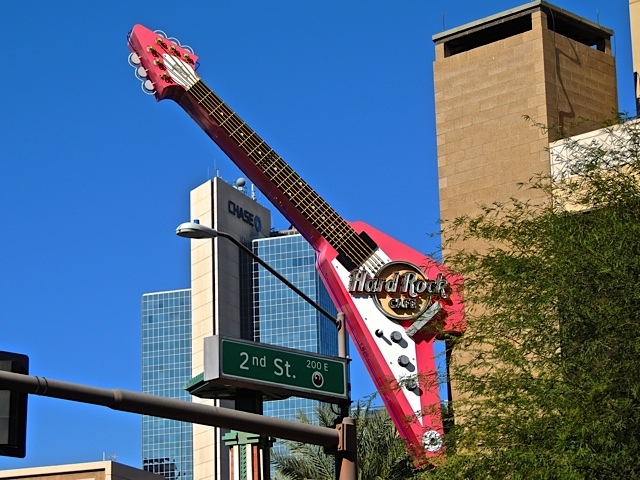 Many big cities have Hard Rock cafes and Phoenix is no exception. 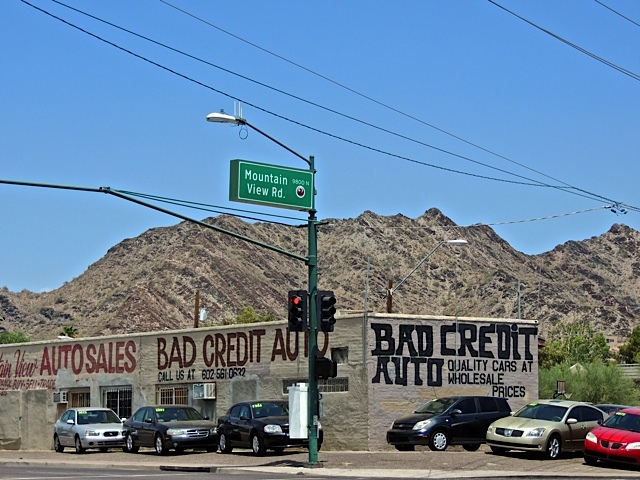 It used to be located in a great spot along Camelback Road and it was a large and nicely decorated restaurant. 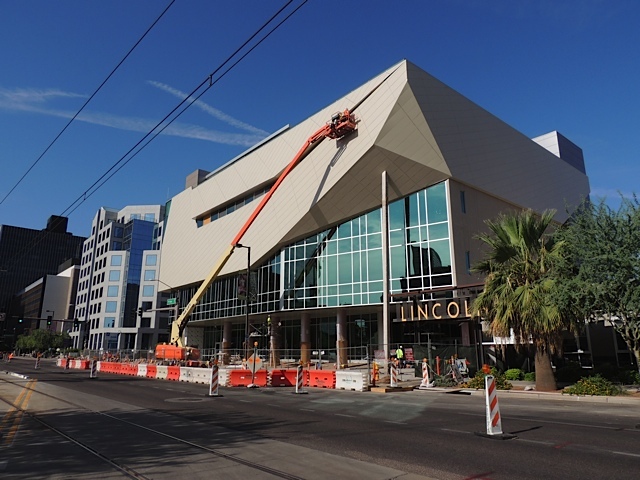 A few years ago it moved downtown right across the street from US Airways Arena and the Chase Field Ball Park. Now it's a much smaller restaurant with more of a sporty feel. I guess that goes with the territory. 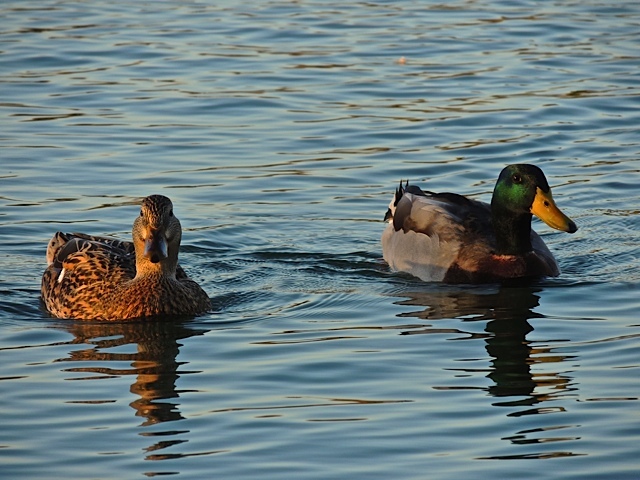 A pair of ducks out for a late afternoon swim in Steele Indian School Park. Three flower boxes all in a row. I spotted this around the St. Joseph Hospital complex. 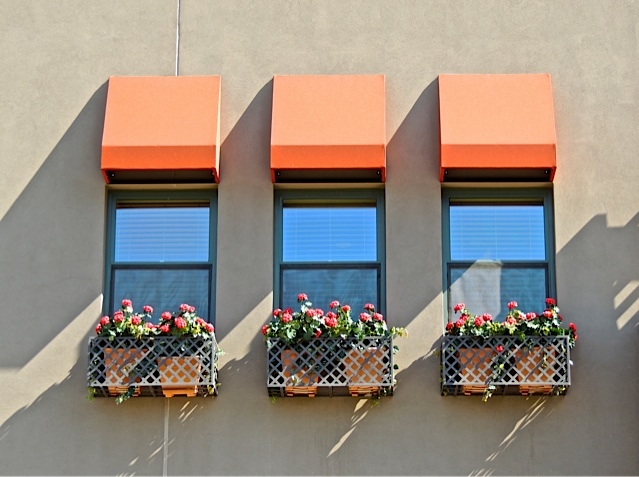 I'm not sure what the building is but, I like those three windows, their awnings and the great flower boxes. Not something you see in Phoenix very often. I forgot about these photos I took about three weeks ago when I took a drive to the top of South Mountain. 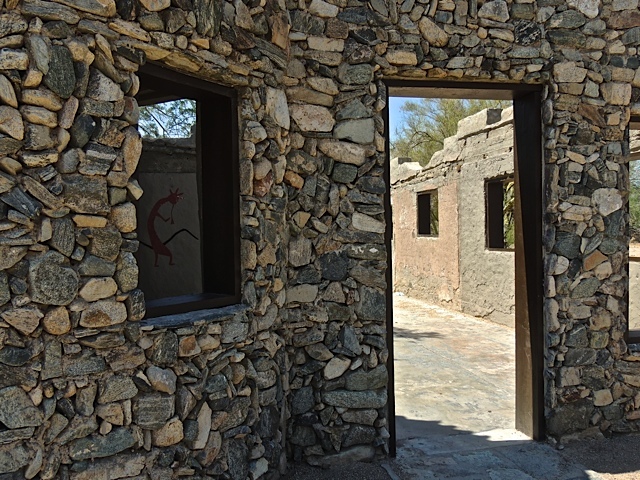 South Mountain Park is located at the very south border of Phoenix and most people recognize it as the place where all the TV and radio towers are located. I suppose the altitude gives them a bit of a transmission boost. Right at the entrance to the park, is this place called Scorpion Gulch, the ruins of an old trading post dating back to 1936. 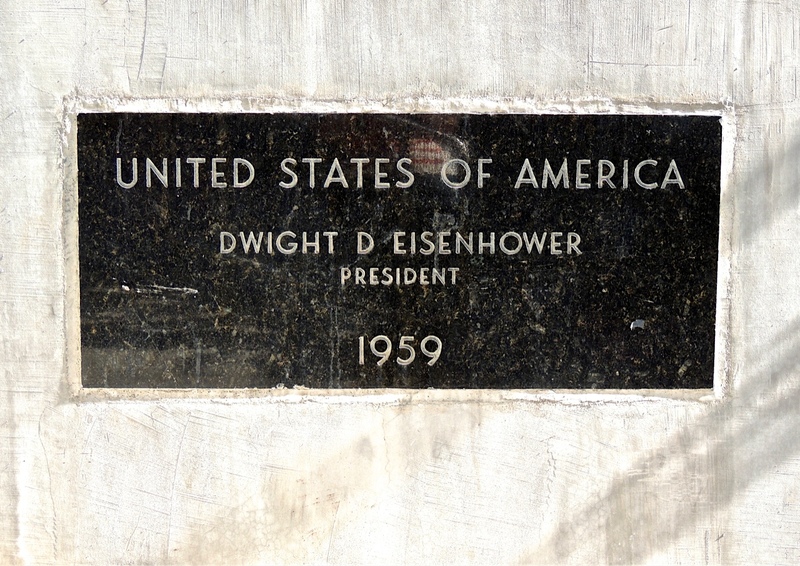 It's been placed on the Phoenix Historic Property Register. I'm not sure if there are any plans for it but it's interesting to just walk around the old buildings. 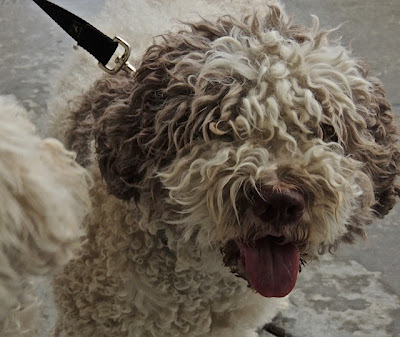 My sister Judy and I met a couple of friendly dogs while on our shopping trip in Prescott last weekend. The dogs are a breed called Lagotto Romagnolo, Italian dogs used as water retrievers and more importantly, truffle sniffing dogs. They had very exotic names that I promptly forgot. Sorry guys! 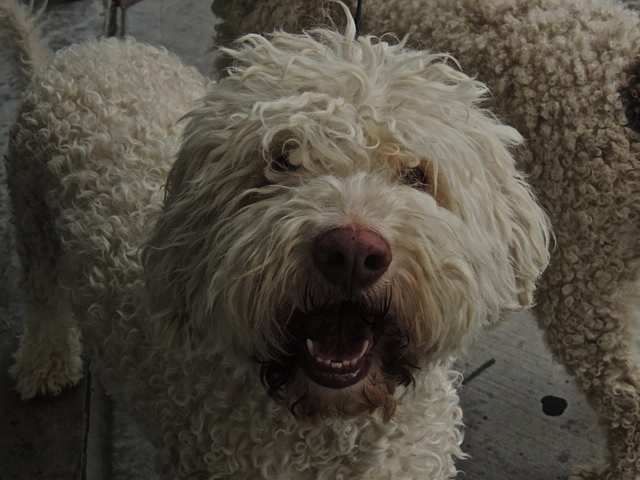 Their coats are very dense and curly to the touch and their owner said they do not shed. When I looked up the breed, I learned that their coats are waterproof. These two came all the way from Budapest. 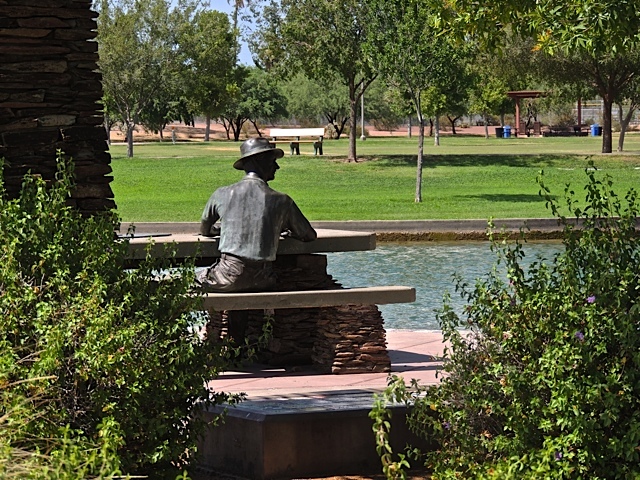 On my way home from the trip to Prescott on Saturday and a little bit after I had passed that torrential downpour, I stopped at a rest area called Sunset Point on I-17. I stopped specifically to snap a few pictures of the swirling clouds. I love the way the sun is breaking through those thick clouds and creating streaks of light. 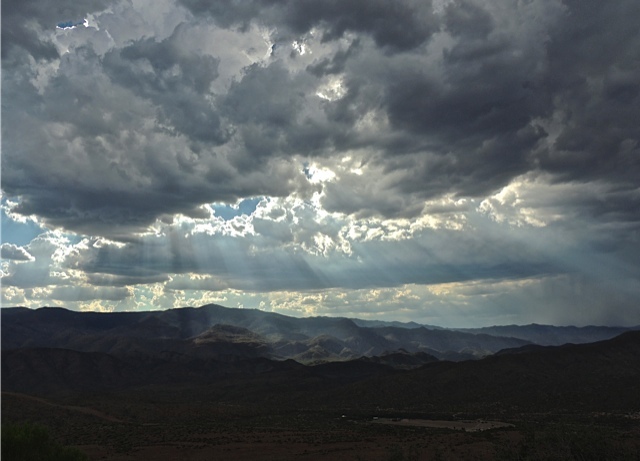 I'm still keeping my fingers crossed that some of these rain-laden clouds will make their way to central Phoenix. 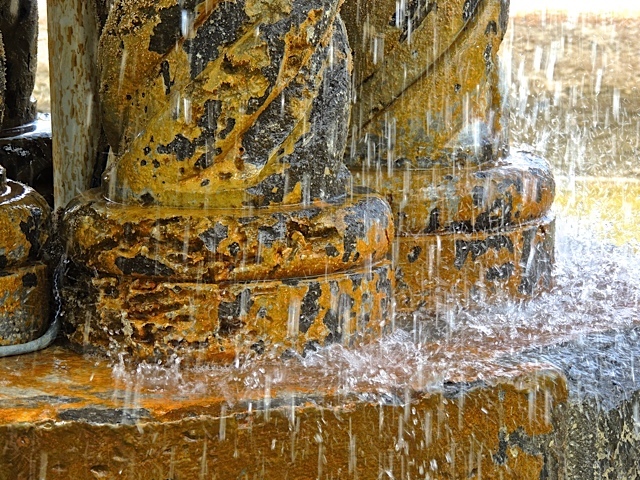 It looks like a nice healthy rain but alas, it's just the base of the fountain I pictured yesterday. However, I did experience some rain yesterday, heavy rain. I drove to Prescott to go shopping with my sister Judy and it rained on and off most of the day but, when I drove home I ran into a torrential downpour. It was raining so hard I couldn't see the lines in the road and had to slow down to about 30 mph to make sure I stayed in my lane and on the road. Everyone else slowed down too so it wasn't just this "drive-in-the-rain" novice who was having trouble seeing. Thank goodness that one storm only lasted about 20 minutes. Oh, I almost forgot, not a drop here in Phoenix! We had an excessive heat warning yesterday with the temperature soaring to 112 degrees (44c). Whenever that happens you can count on some monsoon clouds to start building up in the late afternoon. 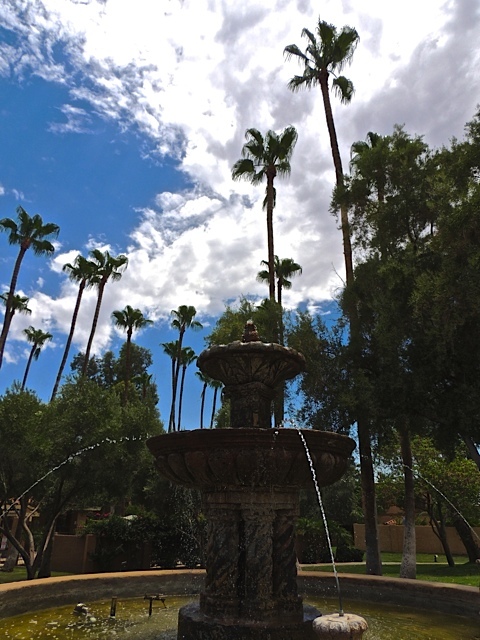 This refreshing fountain in northern Phoenix at least looks cool! I posted a photo of this colorful playground back in 2010. At that time, this facility, Ryan House was just preparing to open to serve children with life threatening medical conditions and their families. 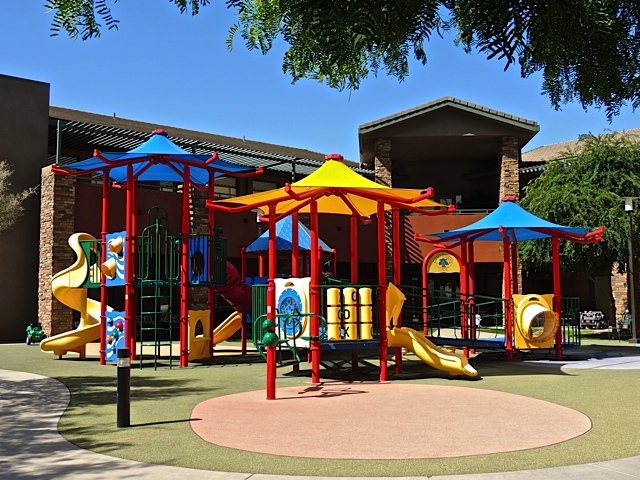 I remember being struck by the bright colors and compact nature of this little playground and I have to admit that I wondered whether those bright colors would survive the harsh, destructive nature of full exposure to the Arizona sun. I'm happy to see that they certainly can. Three years later and just as bright as the day it was installed. Click the link and see the 2010 photo. This gate appears to lead to a garden but I dare say, the garden is looking a bit bedraggled. 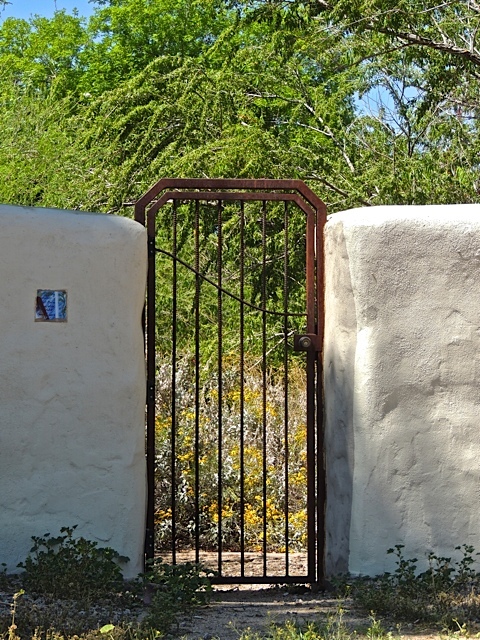 Still, there was something about the gate that did make me stop and take a peek inside. 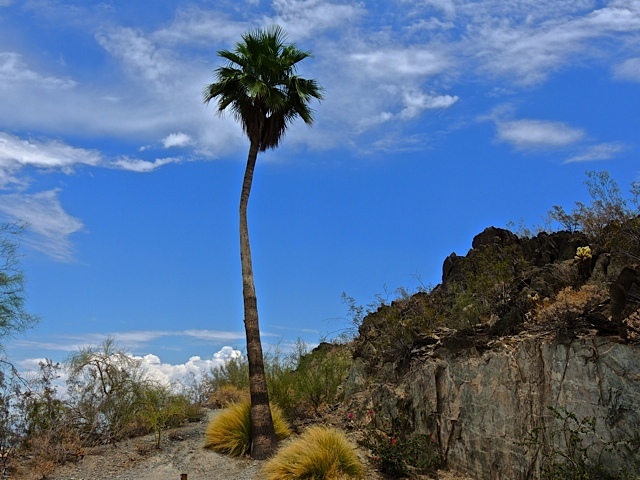 One day I was driving around the hilly grounds of the Tapatio Resort in north Phoenix when I spotted this lonely palm tree on the hill side standing there all by itself and soaking up the sun. The poor thing appears to have a little 'crook' in it's neck. 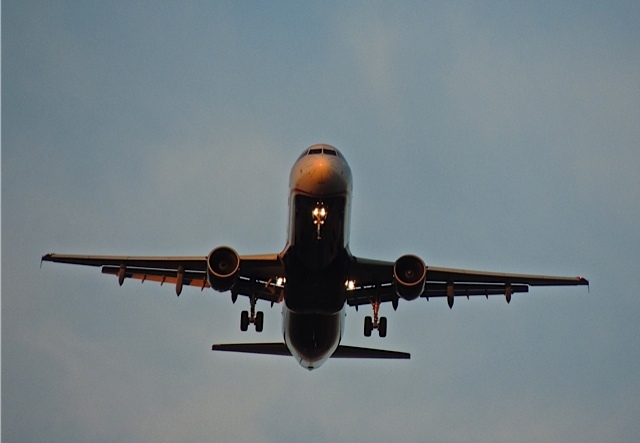 I'm winging my way back to Phoenix today after a long weekend in California so I thought I'd feature my airplane coming in for a landing. Well, it's not my exact airplane but, I bet it's one just like this. I took this shot last week when I was having dinner in downtown Tempe. The planes coming in from the east fly right overhead, not quite this close though. I did extend the telephoto to get this shot. On Sharon's Sojourns today I'm showing a view of the St. Louis Arch when a fog rolls in. I found this mural on the back of a downtown nightclub called The Crescent Ballroom. I'm not sure I understand the message but to me it looks like it might extolling the virtue of not drinking. Seems an odd message for a nightclub but, who knows. 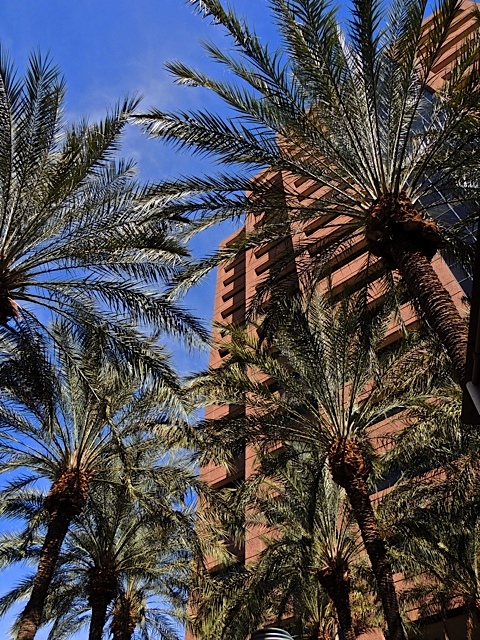 Tall palm trees and even taller buildings! 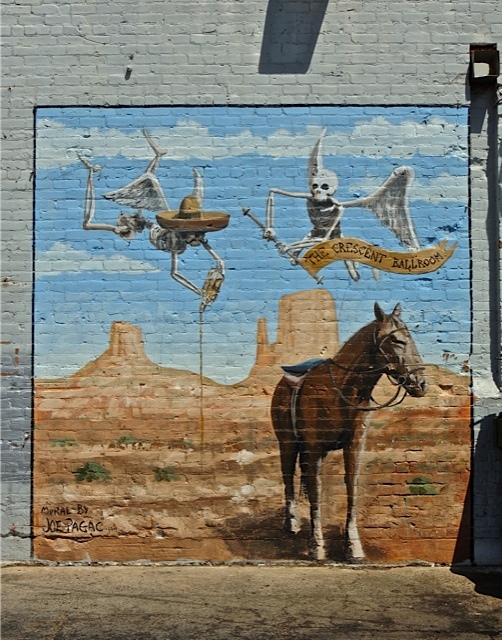 A typical southwestern city scene. 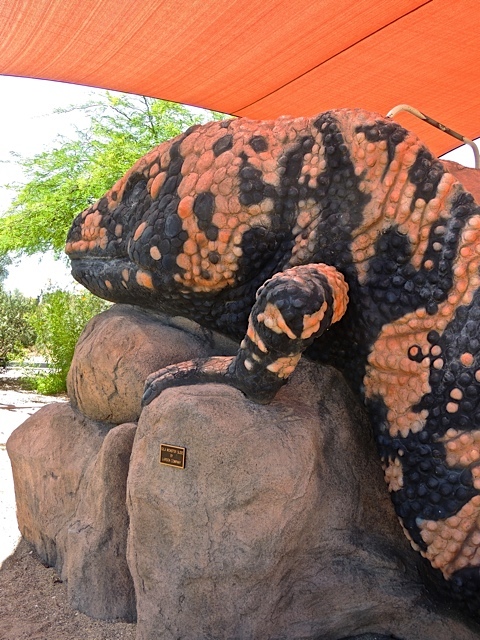 We grow our lizards big here in the desert southwest! Actually, this is a slide in a children's playground in the city center of Carefree Arizona. If you look closely you can see a handle bar on his back. Sharon's Sojourns is visiting a glacier today! 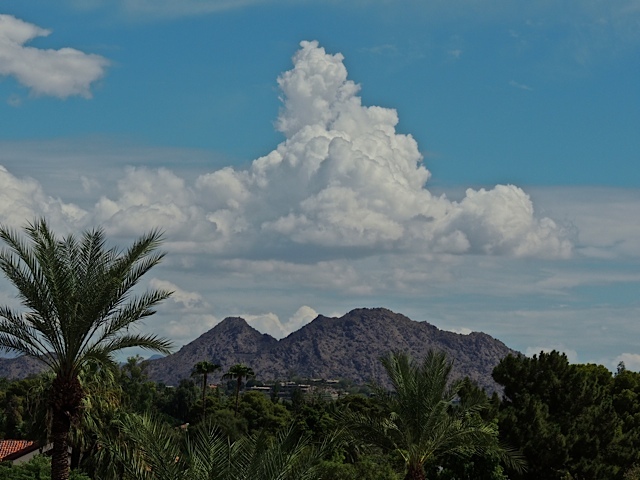 A week ago last Wednesday I had a photo of Camelback Mountain with a huge puffy cloud over it. 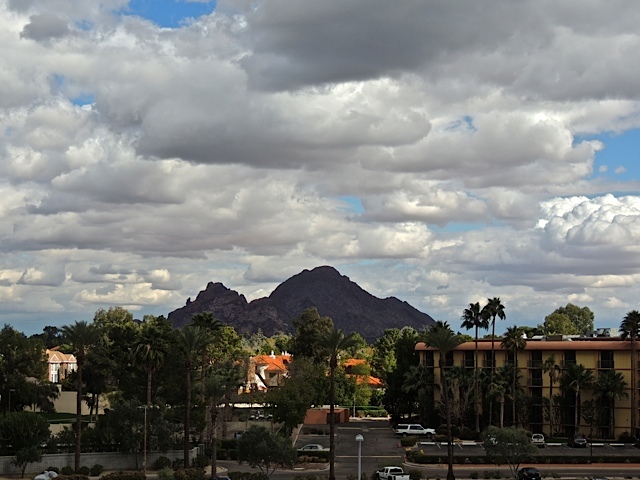 Here is another view of Camelback with some different clouds hanging over it. As I've said before, I love this time of year when the sky is ever changing and always presenting new looks. 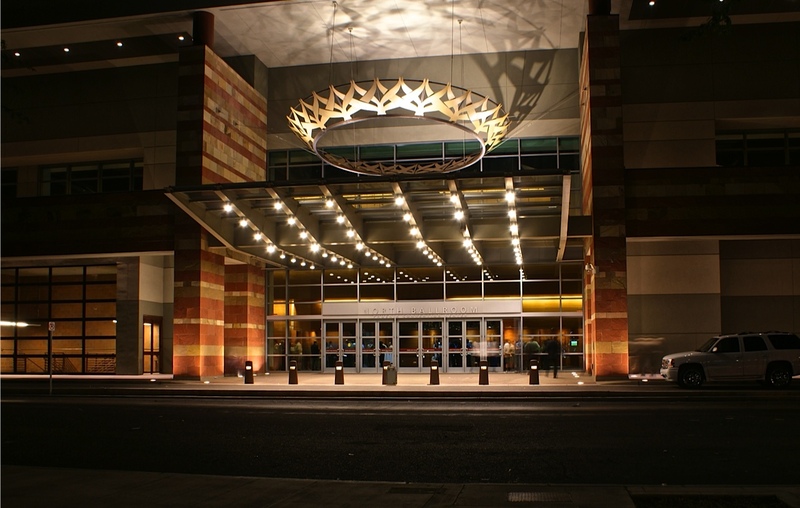 One of the Entrances to the Phoenix Convention Center. I don't think I had ever noticed that crown over the entry before until it was all lit up at night. I saw this sign attached to an electrical pole in an industrial area near downtown Phoenix and it turned into a bit of a brain teaser for me. I couldn't figure out what it was supposed to represent. I've come to the conclusion that someone has created a piece of art out of some old election campaign signs. 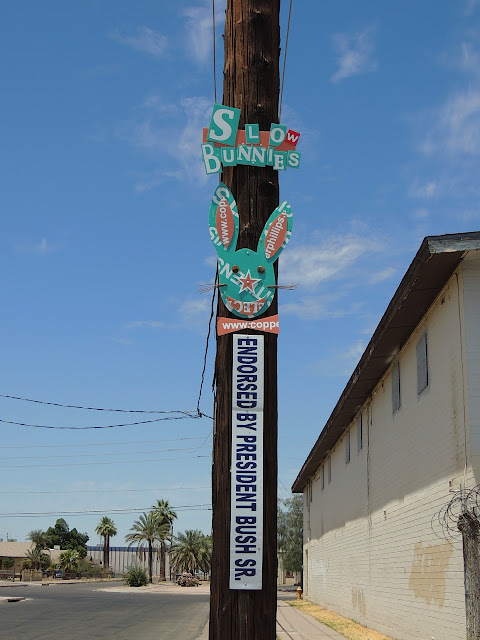 The Slow Bunnies sign and the bunny face appear to be cut from the campaign signs of someone who ran a few years ago for Scottsdale city council and I know I saw that "Endorsed by" sign slapped across someone's campaign sign a few years ago too. I can't say that I get the joke if there is one but I did enjoy the search. A trip to the top of the world is up on Sharon's Sojourns today. Sometime after the Oklahoma City bombing of the Federal Building there, I saw concrete barricades go up around the Federal Building in downtown Phoenix. At that time they were those ugly concrete barriers we see on the sides of roads during construction activity. 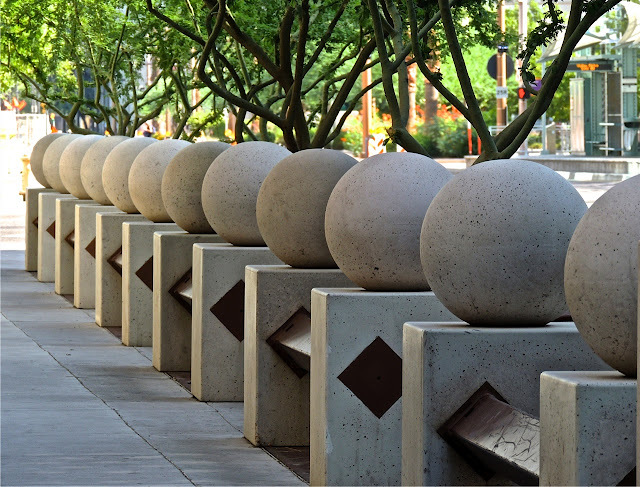 Since that time the barriers have been converted into an attractive arrangement of concrete posts topped with concrete balls. 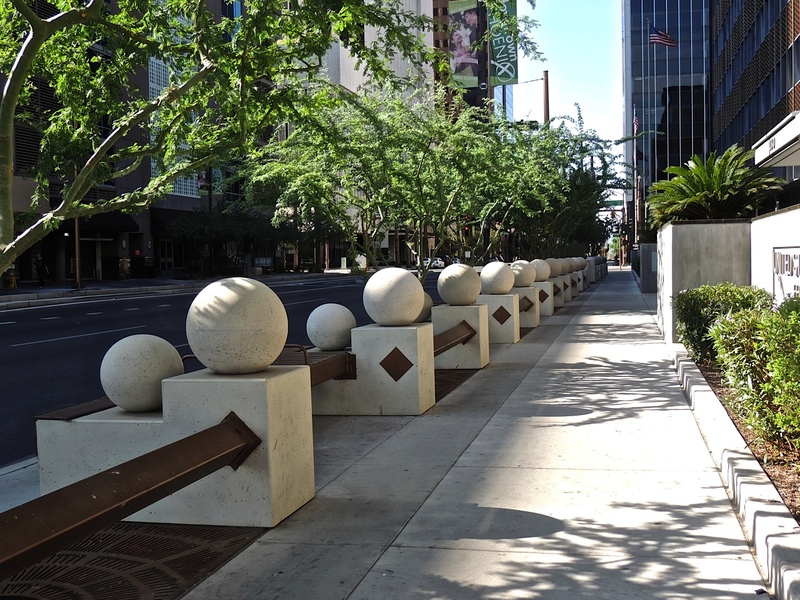 In between the concrete posts are steel beams and seats for people to use as a place to rest. I hate the thought that these are necessary but I'm glad they have been constructed in a way that is both appealing to the eye and useful. 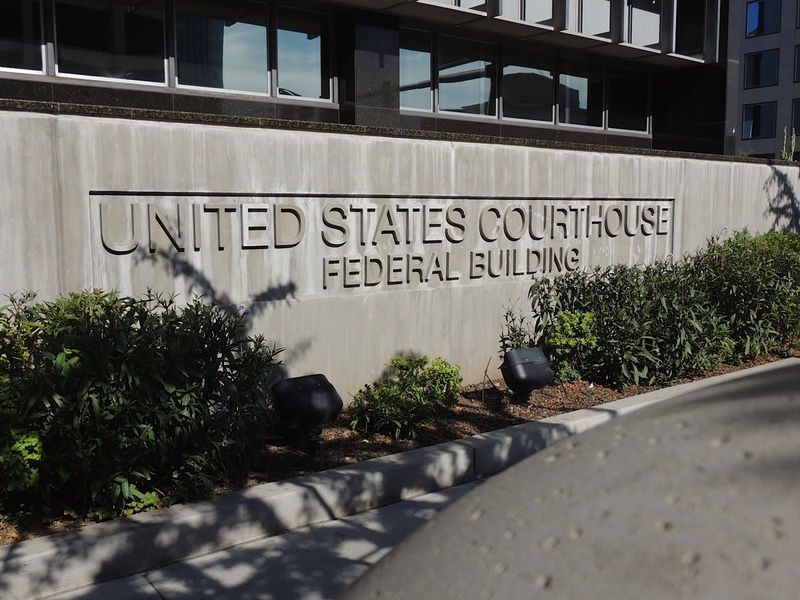 The Federal Building in downtown Phoenix appears to be caught in a time warp. Has anyone seen a DeLorean hanging around? 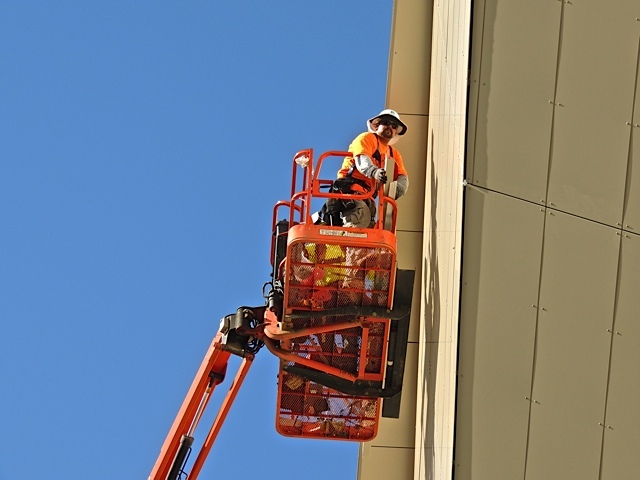 Putting the finishing touches on the New ASU Downtown Phoenix Recreation Center. I think he spotted me taking his picture. I discovered that if you go downtown early on a Saturday morning it's not only more comfortable to be outside but, you can catch a lot of construction activity that goes on before the streets get busier. 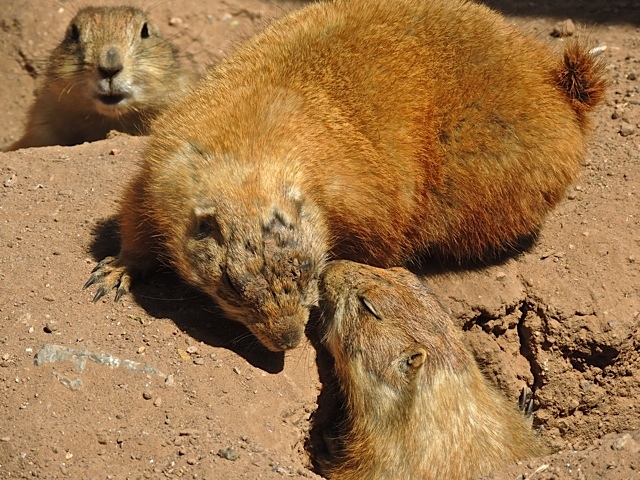 "Shhh....Be careful of that one behind you, she's a real gold digger!" I wondered what this man was doing sitting in the park on such a hot summer day. So I walked around to take a peek and found that we was playing cards all by himself. 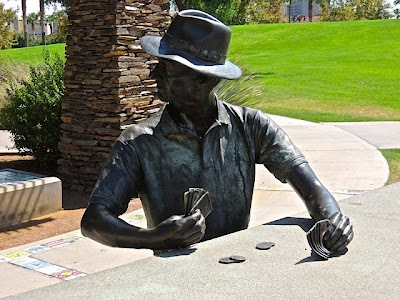 The sculpture is called "Setting up the competition" by J Seward Johnson Jr.
At first glance, I really did think someone was sitting at the table. This month's theme was an easy choice for me. 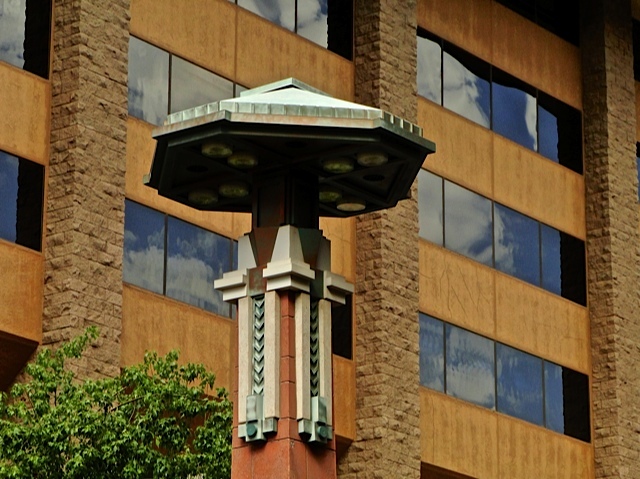 Phoenix has some very unique and in my mind, beautiful street lamps in the downtown area. These art deco lights remind me of a Frank Lloyd Wright design and who knows, the could have been an inspiration for them. To see how other city daily photo bloggers have depicted "street lamps", click here.